Every business needs a brand and every brand needs a refreshment at some point. The time is merciless, marketing trends switch one another with increasing pace and no brand ever is eternal in its original look. If you feel your brand is under-performing or fail to reach your target audience -- take action and breath new life into it. Rebranding is the process of giving your business, product or service a new feeling and idea it carries with. Such change can be made by altering the visual, verbal, sentimental attributes of your product and, eventually, emotions the brand evokes when perceived. There’s no trouble in making changes to your brand, but it’s not easy to do it right. To ensure your online store rebranding meets success, you need to learn what are the common pitfalls brands encounter when changing their look & feel and how to avoid mistakes before they damage your revenue. Ecommerce business rebranding needs to be underpinned by facts and reasons. Instead of rushing to changing your brand image, learn what are its current strong and weak sides, what does it portray about your company and how customers see it. All these can be concluded from a market research you need to conduct before performing any actual changes to your brand. Customers are on the driving seat and both current and potential clientele should be your inspiration. Avoid false moves by learning your customers’ behaviors, preferences, wants and needs. When rebranding, you need to retain the core attractiveness of your brand it has now -- the one your current customers enjoy. Otherwise, by losing familiarity with who you are, you may lose a significant part of market share too. The need to revitalize your brand doesn't mean it’s all that bad. Think carefully if you need a total revamp or just a few slight tweaks that would bring positive change to your brand’s performance. If Amazon suddenly turned into something far away from how it’s known by its customers, it would doubtedly considered by its audience as a good thing. Brand is often confused with its physical symbols: logo, product design, motto, colors and overall external appearance. However, re-doing logo or adding a bit of flare to your company website is not rebranding, but simply redesign, the meaning of which those two should not be confused. Brand is a combination of both the material and immaterial elements -- the latter includes company’s philosophy, customer experience and other ideas hard to be framed. Using in-house resources for branding is a reasonable choice that would most likely be more cost-effective and fast, yet not always the one true. Often, the result of such decision would be a brand that reflects internal plans, perceptions and expectations within your company, but not how your target audience view the picture in a whole. Hiring external brand specialists would help your company to add an external element to your company image and make it more “real”. It would give you valuable insight into how your brand is viewed by a third party and adjust these expectations to what’s your company actually is like. Outsourcing is a definite way to help you being too much subjective and falling out of race. When rebranding, there’s much inspiration to draw from other industries, not yours only. Even though you’re bound to compete with e-stores in the same niche, sticking to “local” trends too much would make you dull and common. Marketing techniques are mostly about creativity, and that can be learned from any good company irrespective of the niche. Innovation and creativity from diverse areas can do wonders to your branding strategy. 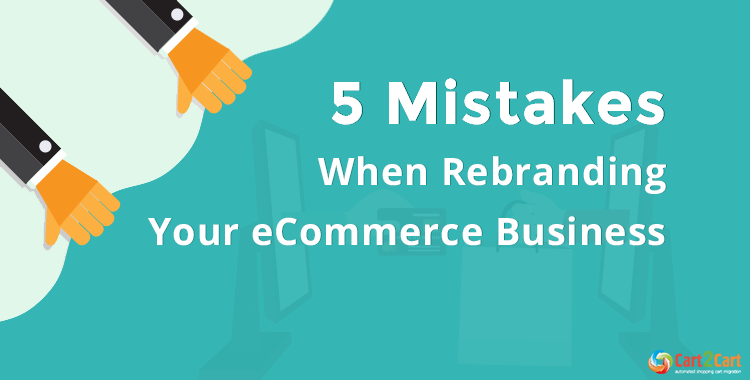 Shortly but truly, these are 5 common mistakes when rebranding your online store or business in general. No matter how small your store is, every business eventually grows into something substantial. Having a well-established and polished brand until that time would make your business differentiate from all the rest and help in further development.